Movie clip showing Elvis using his stereo vision to locate a target (indicated by bright red spot) and move his index finger to it. Two target points are shown. In the first he places his finger within a few centimetres from the target. In the second, his finger collides with the target. He had less success with a few target points, such as those at the extremes of his stereovision. 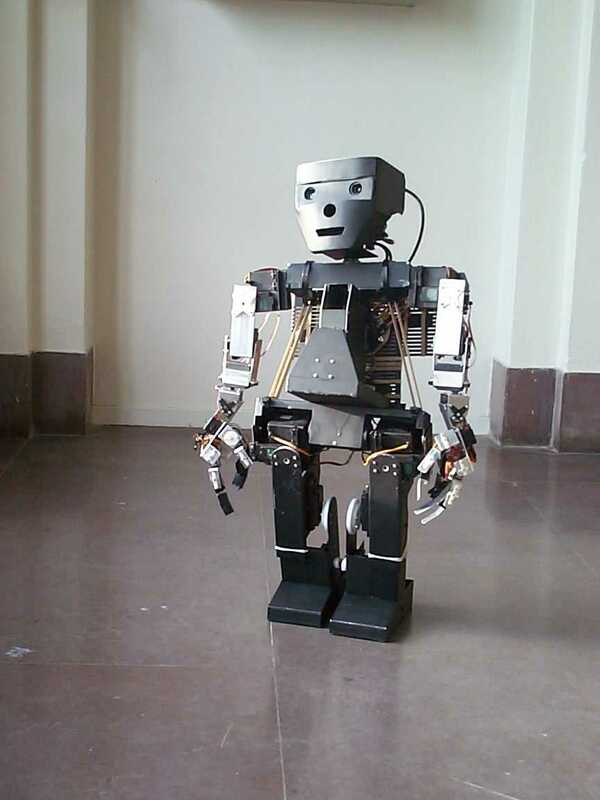 Elvis is a 60cm prototype of a full scale humanoid robot. Picture of Elvis. Many pictures of Elvis and Priscilla. Elvis is now in the science exhibition Universeum in Goteborg. BBC newstory of Priscilla at RoboCup. Collection of Training Data. 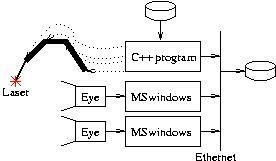 Data driven C++ program waves arm in front of robot's eyes. Both arm commands and apparent position of Laser are logged to disk. 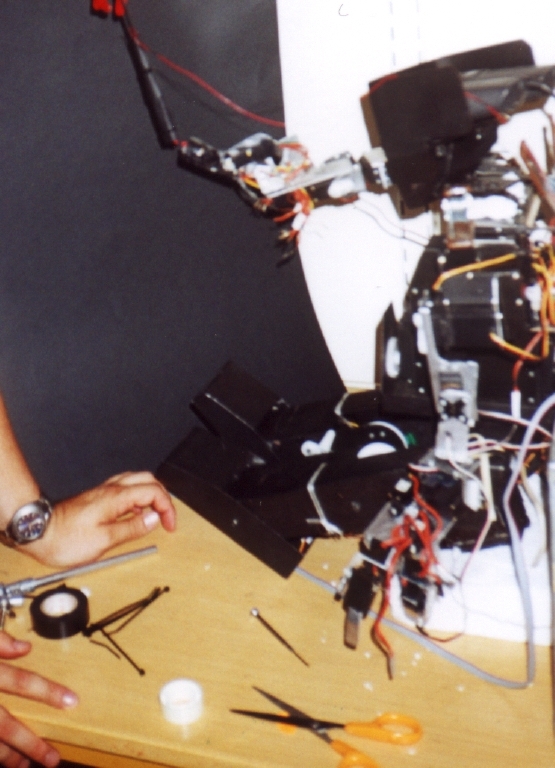 GP driving robot arm. 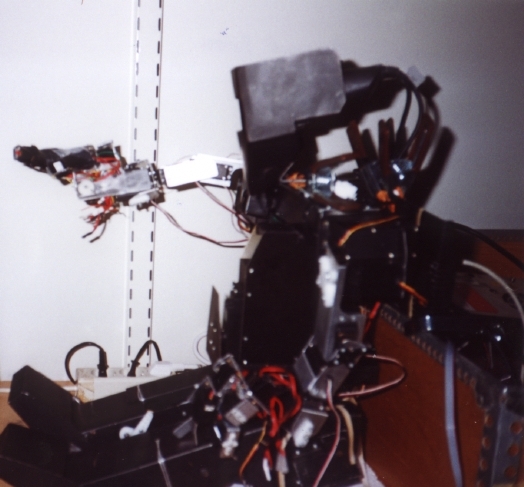 The robot's eyes feed the apparent position of the target (indicated by the laser) to 4 GP programs which together drive the arm to the laser. Robot finger tip (bright red dot) driven by GP to target laser (bright red dot on vertical mount). Identical mountings were used for both finger tip and target lasers. A spherical translucent glass bead (pink) is mounted directly in path of red light (dark red) emitted by a solid state laser (short black rectangle). To shield the direct light and so reduce reflections, the whole is mounted inside a brass tube (approximately 6mm in diameter by 10mm in length). Special thanks to Manne Kihlman and Marcus Tallhamn, who did excellent work in developing the hardware design for Elvis. Per Svensson, Bjorn Andersson, Rikard Karlsson, Thorbjorn Engdahl, Anders Eriksson and Christopher Graae have also made significant contributions to various parts of the project. Funded in part by the Wennergren foundation, Swedish Business Development Agency - NUTEK and TFR.